Karma is not just a metaphysical philosophy. It is real, and it wants to manifest into your life for better or worse. The planets trigger your karmic seeds that already exist. Clearing karma while it is in seed form is not difficult, but it requires being alert and focused. A lot of bad karma can be avoided just by staying conscious, but once a strong karma has taken root, then you need professional help. The 13th Moon (Pradosham) has the mystical powers to dissolve your karma. Participate in the karma-removal Pradosham rituals. Pradosham is one of the most important remedies for clearing karma. Pradosham occurs at dusk, 1.5 hours before sunset. Praying to Shiva at this time will free you from karma, fulfill your wishes, and can even accelerate your evolution toward liberation (Moksha). 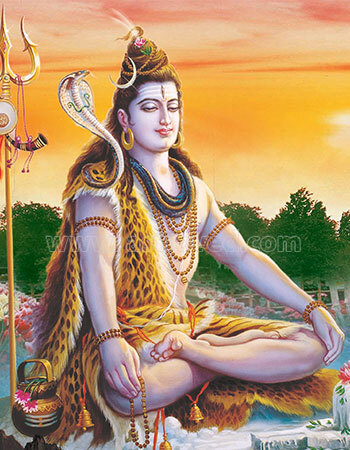 Worshipping Shiva on this day will shrink the negative karma that is blocking your spiritual growth and prosperity. The karma-busting sounds THIRU NEELA KANTAM are effective to recite during the Pradosham period for however many repetitions you are able to do. Visualize a laser beam of blue light entering your throat and that the sounds are drilling through negative karma and bursting those seeds so they do not take hold in your life. 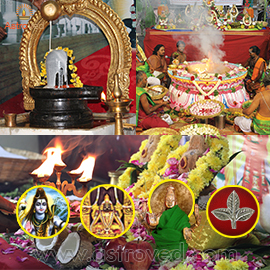 AstroVed is very pleased to offer you authentic Pradosham rituals, which can be performed on your behalf during this time for redemption from the sins accumulated over eons of births. The reason you struggle in life is due to negative karma, and while it may teach a great lesson and it is often painful. Participating in a Pradosham ritual can bring immediate relief and a sense of freedom, and can have a positive influence on both the material and spiritual aspects of your life. 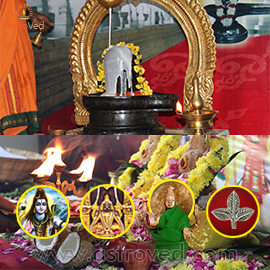 The medium-sized crystal Shiva Lingam will be energized in the Pradosham rituals Lord Shiva is conceived in his unborn, invisible form as the Shiva Lingam. The Lingam represents the male creative energy of Shiva, or cause, and is worshipped as the Supreme Consciousness or Highest Intelligence. An Anointing/Hydration Ritual/Abishekam to the Shiva Lingam performed at special times helps dissolve your karma. You will receive the energized medium sized crystal Shiva Lingam along with the sacred grey ash powder and kum-kum (Red Vermillion Powder), which will be blessed in the rituals. Keep the Lingam in your meditation altar and wear the prasad on your forehead during meditation or at other times to expand the Divine blessings into your life. 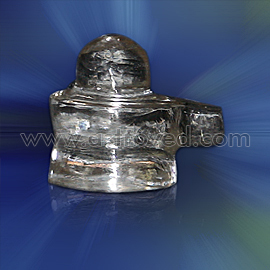 Please Note: Your energized medium sized crystal Shiva Lingam and Prasad shipment starts from Chennai, Tamil Nadu a week after the entire set of rituals is performed. For international shipping, please allow 2 – 4 weeks for delivery. Participate in the Essential Rituals for Pradosham Shiva is the archetype who destroys the negative karma that limits your growth and success. Pradosham, the 13th Moon, is the most powerful time to receive his blessings. our Vedic specialists will perform a hydration ritual to call upon the energies of Shiva, and will perform a light & sound ritual to absorb your negative karma. Please Note:The shipment of prasad starts from Chennai, Tamil Nadu a week after the entire set of rituals is performed. For international shipping, please allow 2 – 4 weeks for delivery. 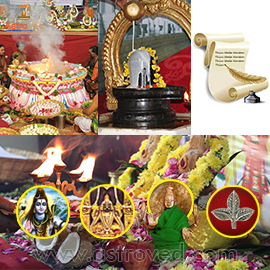 Participate in the enhanced Pradosham rituals Fire Labs are the most evolved spiritual technique to invoke divine energies for speedy results. A group Fire Lab to Lord Shiva on Pradosham day will help you remove your karma. Special Archana to Mercury and Shiva will also be performed Our Vedic specialists will perform a hydration ritual to call upon the energies of Shiva, and will perform a light & sound ritual to absorb your negative karma. Participate in the Elite Rituals for Pradosham Pradosham times are the windows of opportunity when you can seek the blessings of Shiva to remove the karma or karmic energies that limit our potential in this current life. Invoking the energies of Shiva through a hydration ritual and a light & sound ritual, along with group Fire Lab, will help you connect with Shiva, who absorbs negativities to expand possibilities for growth and abundance.